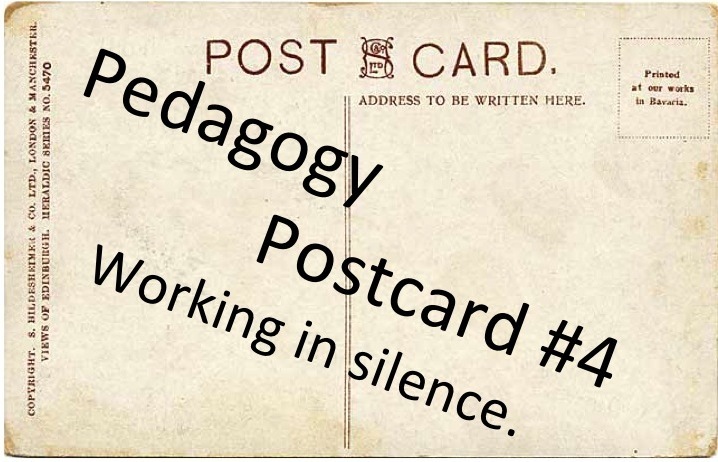 Pedagogy Postcard #4: Working in silence. There’s a particular kind of learning atmosphere that I love to create every so often to inject some real purposefulness and focus: silence. Not just ‘quiet’: absolute, total, complete, you-could-hear-a-pin-drop silence. If a silent atmosphere is created in the right way, with the right spirit.. it means this: ‘OK; we’ve done all the talking, we’ve thrown up all our ideas.. now it’s over to you to bring it all together, to get really stuck in and produce something that shows what you’ve learned, by yourself.’ It’s intense; intensely productive and intensely concentrated. And then, after an appropriate time has passed, ‘Right then, let’s see what you’ve got’… the silence breaks and the output is revealed. 1. The teacher calls for ‘silence’ when they think a class is too noisy. ‘OK.. let’s have silence! I want you to work silently’ The noise level drops but the teacher then accepts a general hubbub; they didn’t want silence at all – just a little less noise. Here, the students come to understand that ‘silence’ means.. ‘carry on talking, but just a bit less loudly’. Nothing has really changed. 2. The teacher is FED UP and demands ‘SILENCE!’ They enforce it – absolutely. Nobody breathes…the electric fence if fizzing in anticipation of a transgressor to FRY!! Here silence is properly oppressive. Scary. It signifies heavy discipline and constraint.. not the freedom to express ideas without interruption. It’s not a great atmosphere to work in; it’s just a dark cloud that won’t shift. It’s miserable. 3. The teacher wants to talk so asks the class to be silent. ‘I’m talking so you should be silent’….but the silence never arrives because the teacher is talking! Wanting silence to fill with your own voice is a contradiction. What they want is for the class to listen. But being silent and listening are not the same thing… Silence is for everyone..it’s all or nothing. For a start, it gives them time to think properly. A classroom full of noise is often bewildering…silence can set you free to really think. Silence creates focus; students know it won’t last for too long – so they have a limited time to get into action and that often yields a great burst of productivity. Finally, pen is put to paper and the writing starts or the paint flows or the measurements come thick and fast. The social pressure in any group is strong…the need to engage in the endless stream of banter is oppressive – even if an average teenager will never admit it. Silence is liberating on many levels – if it’s done in the right spirit. Finally, silence puts everyone on the spot; the ‘phone a friend’ option has gone and students have to rely on their own resources. This is a ‘no conferring’ situation. This tells you more about how much they’ve learned than many other activities; what they produce in that time is down to them alone; the passengers need to get up front and drive! The silence I’m after is always absolute. There is no talking at all. None. Not even from me. It’s heads down and no nonsense. If someone needs help, it’s a whispered whisper. It’s time limited, notified in advance. Silence is always oppressive if you don’t know how long it’s going to last or if someone else is controlling the end point. It’s positive – never punitive. I want my students to embrace the silence, not fear it or resent it. I keep it back for special occasions and don’t over-use it; I want to preserve it for when we really need a burst of positive action, free from the noise. It’s not a sanction; it’s a haven. The beautiful sound of silence. Thanks for this post. I never really thought about it before but you’re spot on that /Silence/ is its own unique thing, and one that seems to be an acquired taste. I wonder if silent contemplation is going to become rarer and rarer as children spend more and more time on screens, and never develop the necessary tolerance for silence. Thanks for this, Tom – am enjoying all your Pedagogy Postcard series. This one made me think of the “rookie error” I too often made in the early years where pupils were working in concentrated silence and I interrupted them either because I felt I wasn’t doing my job if I didn’t intervene, or I got bored….. Eventually I realised that the teacher’s role is to get them to that point and then LEAVE THEM ALONE! I did know better later in my career! Haha.. I recognise that all too well. That itch to break the silence! Across a school, it’s also tough if different teachers have different levels of noise in mind when they ask for silence. It needs to mean one thing: absolute silence. Your silence is music to my ears Tom! As a primary school teacher I employ silence during art lessons. The quality of the children’s work also increases when I work on my own piece of art alongside them. They can ‘see’ the results of silence as well as ‘feel’ it. As you say in your post, I have found that children buy into the whole idea of working in silence when real silence is modelled for them. As much as I love the hubbub of the classroom, I love these periods of quiet productivity just as much. Couldn’t agree more. It’s one of the few ways in which we, as teachers, know exactly what our students are capable of AS INDIVIDUALS because what they do in that time is their own work.